Jeremy commented on the post Future book printing raising the question of e-book pricing. I think we pretty much all believe at the moment that e-book revenue is additional to print revenue. Of course customers may stop supporting the printed book, and when they do we will have the problem Jeremy raises of amortizing our origination costs over sales of the e-book only. Even in today’s half-formed e-book world I think the problem is less than Jeremy fears. Most people who comment and agonize about e-book pricing are writing from the perspective of book buyers not book publishers. See for instance this article from Forbes on 14 January. There’s a lot of noise in these sorts of analyses created by self-published books — a boom industry now that it’s so easy to put your book out there in electronic form. The economics of self-publishing and regular publishing are wildly different, and just because self-published books tend to be cheaper doesn’t I think mean that eventually that’s the only way things will be done. The focus on the price paid by the consumer can be misleading. From the publisher’s point of view the interesting number is the price paid by the retailer. Future Book tells us on 15 January: “For example, Life of Pi, as mentioned below, has shifted 250,000 copies in e-book format since it was priced at 20p. As Canongate is the unwitting partner in this promotion, its revenue from those sales would far exceed the £50,000 consumers have paid.” On Amazon.co.uk today The Life of Pi shows at £3.85 for the paperback, discounted from the publisher’s price of £8.99. This means Canongate are probably getting about £4.50 for the book and Amazon is selling at below cost. Canongate list the e-book at the same price: Amazon won’t tell me the UK pricing for e-books, because they know I’m in America and they don’t want to sell to me because of rights. Too bad — I’ll switch into dollars. In America The Life of Pi e-book costs $8.63, and the paperback book costs $9.56, discounted from the publisher’s price of $15.95 — actually on the Houghton Mifflin Harcourt site the price shows as $15.99: refreshing to see Amazon make an error even if it’s only 4¢. Future Book‘s implication that Canongate was an unwitting partner in the 20p promotion is possible, but may not be true of all 250,000 sales. These Amazon promotions can sell lots and lots of copies of the e-book, but they are normally (at least in USA) a joint promotion with the publisher, who will have set the retail price at 20p for the duration of the promotion, selling the e-book to Amazon at roughly 10p. But these cheap sales are all additional revenue, coming after many copies have been sold at the full price, and an additional £25,000 is certainly not to be sneezed at, even after the author has had his share. The marginal cost of selling another e-book is tiny, and lots of overhead contribution will have been made by earlier (and subsequent) sales at the higher price. Indeed one of the unexpected benefits of these promotions is that there’s a sort of shadow effect: after the discounted price has elapsed, customers who missed the offer will buy at full price in larger than normal numbers. Retailers indulge in all sorts of crazy discounting. Selling the product at a loss, presumably Amazon is hoping to make up the difference on sales of the Kindle itself. From the publisher’s point of view huge sales numbers are wonderful — word of mouth is what we all aim to generate, and if one and a quarter of a million people buy your e-book you are going to get a lot of word of mouth. 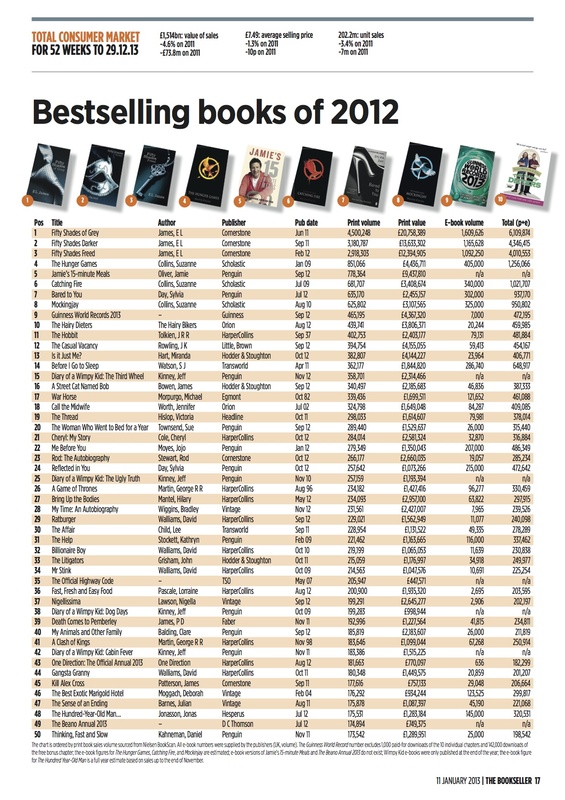 And the sales can by astronomical: here’s a chart from The Bookseller showing the UK e-book bestsellers of 2012. These books are of course all trade books. If the book is an academic monograph, there’s little chance of it’s being available from Amazon in e-book form. E-sales of academic books will tend to be as part of a large collection, licensed to library consortia. Whether the economics of this model are sustainable in a world without any print sales I have no idea, but I suspect that they are, since the licenses are quite expensive. Eventually no doubt this market will develop, and individual title sales will be made. I dare say, as with lots of trade books, the retail price will be set close to the price of a notional paperback edition. The publishers’ concern with the discounting of e-books has been that the public will “get used to” paying the discounted $9.99 or whatever, and that once Amazon stops selling e-books as a loss leader, book buyers will jib at the “real” price. I suppose there is something to this, but I think discount seekers seek discounts, and if none are available they may regret it, but will still make the purchase. This concern was, ostensibly, one of the main motivators in the recent kerfuffle over agency pricing. The best ebook marketing strategy appears to be simple: price manipulation. Generally speaking, the lower the price, the more units you will sell. And prices are heading lower the Book Industry Study Group confirmed when it noted that over the last four years the average price of ebooks has slid from $10 to $6. And a bit of Kitchen Sink wisdom here: cut-price sales work. Kindle Daily Deals drive big buys, but don’t expect a long term impact, as the halo effect of the resulting jump in sales ranking is shrinking, especially as the market becomes saturated with competing titles. But why, at a digital publishing conference, would someone be talking about bookstores? One of the really exciting things about the way the e-book market has evolved up to now is this ability to vary the price. Print books with their price printed on the cover are more resistant to price changing. Now when the buzz gets loud you can put the price up, and then drop it again when the must-haves have all bought. Reblogged this on Glitter Aurora.